Dear reader, Your Intrepid Reporter was just about bowled right over by the day that Your Intrepid Reporter just experienced. 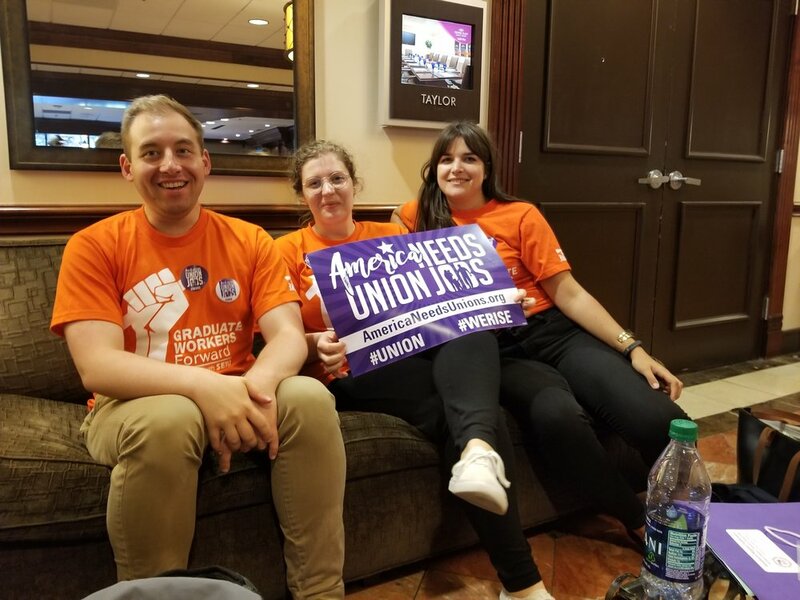 The day began as if beneath a dark storm cloud, when – after the Invocation was delivered – SEIU’s Southern Region Director Harris Raynor invoked the looming threat to labor that is represented by the presidential administration currently ruling this fine nation. But, fret not, for the day brightened immediately, dear reader. Fret not! With a series of exultations of their many victories, SEIU members from Locals across the Southern Region beat away (in splendid fashion) the storm clouds which hover so menacingly on the horizon. Your Intrepid Reporters heard about workers who were able to negotiate for raises, increased bereavement periods for extended family, better health and dental insurance and so many great benefits for themselves and their coworkers. Your Intrepid Reporter also heard a number of stories from members of locals who were successful in recruiting new members, organizing and fighting against illegal decertification orchestrated by the companies they work for. The middle of Your Intrepid Reporter’s day was occupied by a pair of workshops that focused on strategies for organizing new members and engaging them with political actions. During these workshops, Your Intrepid Reporter learned about the importance of holding orientations for new coworkers in order to teach others about the benefits of union membership. For graduate students at Duke, this stresses the importance of the Disorientation week that takes place during the early weeks of each fall semester. In the afternoon, Your Intrepid Reporter attended the America Needs Unions Town Hall Meeting, which featured Georgia State Senator Nan Orrock and Georgia House Minority Leader Stacey Abrams, who is currently running for governor of Georgia. During the town hall, Senator Orrock and Leader Abrams fielded questions from members from locals around the Southern Region. Questions ranged from topics like how Leader Abrams and Senator Orrock plan to improve Georgia’s healthcare system to what they both would do for the state’s homeless population. Repeatedly, both Leader Abrams and Senator Orrock continued to pledge their support for the labor movement. In response to a question asked by Emory Unite member Jonathan Basile, both Leader Abrams and Senator Orrock spoke in support of efforts by graduate researchers and educators to organize and unionize on public and private college campuses. After the invigorating day, Your Intrepid Reporter took a quick break before traveling to Atlanta’s R. Thomas Deluxe Grill to visit with tropical birds and enjoy a great meal with friends from DGSU and Emory Unite. 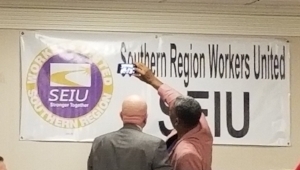 Then Your Intrepid Reporter returned to the SEIU Southern Region Conference and danced until the weary heart within Your Intrepid Reporter’s chest just about exploded.